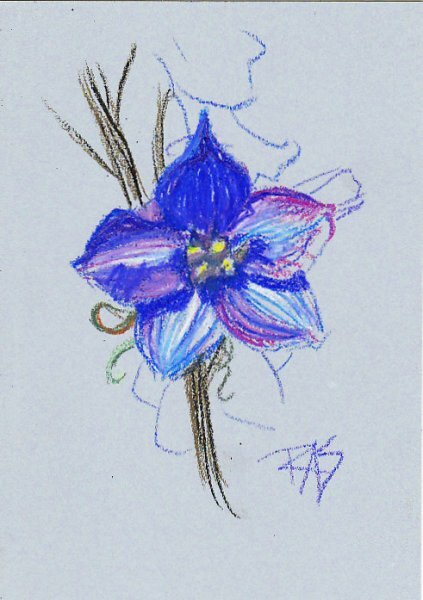 Blue flower study on unprimed light blue mat board by Robert A. Sloan. Louvre oil pastels are a mid-priced student grade brand, not down in the $5 large sets category but under $15 online at MerriArtist.com. MerriArtist is the only supplier I know of for these online and to fill out the order to Merri's minimum $20, I added two Schminke soft pastels. Shipping was a bit high at $11. However, this covered USPS Priority Mail and my package arrived in two business days, which was convenient. Louvre oil pastels are made in China for LeFranc & Bourgeois. They may well be easier to find in Canada or other countries than the USA since they're not carried at either Blick or Jerry's Artarama. I found them an interesting brand with unique qualities of their own. Firm dry round wrapped sticks were standard for "large" oil pastels, the size of Senneliers and others. Color names included some pigment names like Cadmium Red but did not always list "Hue" with the color although one blue did list Hue as part of the color name. It was an interesting juxtaposition that probably doesn't mean anything. Since the set is nontoxic in all colors, that could not actually be Cadmium Red and is a good match for a Cadmium Red medium hue. Some crumbling occurred while I was drawing with Louvre oil pastels. The crumbs blew away easily whether by mouth or by canned air and weren't a major problem except where I ground them into the paper. Scanning both my sketch and the color chart left a lot of crumbs smeared onto the scanner glass so I needed to clean it with a soft rag immediately. Medium firmness leaning toward firm, these didn't blend easily while I was applying them. They seem very suited to broken line techniques and fairly opaque for a student grade brand, though not as opaque as Pentel or Loew Cornell. Metallic gold was nearly transparent and low in pigment, pigment load varied with what color -- so these may be the same pigments Lefranc & Bourgeois use in their other student grade art supplies. Burnt Sienna is either a hue or a real pigment of a different grade, it's much browner than Burnt Sienna usually is in other mediums while Red Ochre comes close to what Burnt Sienna usually looks like. Color names and choices lean toward a painter's palette combined with a chromatic approach, nearly half the colors are greens and neutrals allowing traditional landscapes. I liked the range of greens, it has some good choices and varies enough without near matches. Same with the blues. Red violet and violet are a little close in hue but still different enough to be useful. Two whites are included, Antik white (antique blanc) is a useful light cream color while the White stick is distinctly warm white next to the cold white paper in my ProArt sketchbook. Another bit of evidence that this may be a product intended for Canadian distribution is the bilingual French and English color names on every stick. I charted these 48 colors and then wound up delayed for two days in writing this review and my Niji review. The difference was remarkable. While they were a little stiff and difficult to blend when fresh, two days of rest made them set up hard and difficult to smear. This may make Louvre oil pastels very handy for a firm underlayer that dries hard and can take more color over it -- letting your first layers set up for a day or two is another way to build more layering. They are particularly well suited to quick sketching, producing strong color in broken expressive lines. I used the white for burnishing over some lines in the petals of the sketch and it blended only slightly, keeping some of the underlayer distinct. This could be a useful property in some styles. As with my other oil pastels, I will be testing this set for lightfastness between April 2009 and April 2010 to see which if any colors rate as artist grade for lightfastness. When it comes to creating serious art, durability is important. Because of the hue names and price range, I suspect these may be comparable to student grade acrylics or oils and if some colors have artist grade lightfastness their hard-drying quality may make them useful in underlayers on serious art. Some student grade supplies are lightfast and others aren't -- coarser ground artist pigments and lower pigment load may still have the lightfastness of the original pigments and pass muster in serious art if you like their handling. Till then I'd recommend using Louvre oil pastels only where lightfastness isn't an issue. These are a good sketch set and that hardness makes them excellent for sketchbook use as they will smear facing pages a lot less than others if let to cure with the sketchbook open. 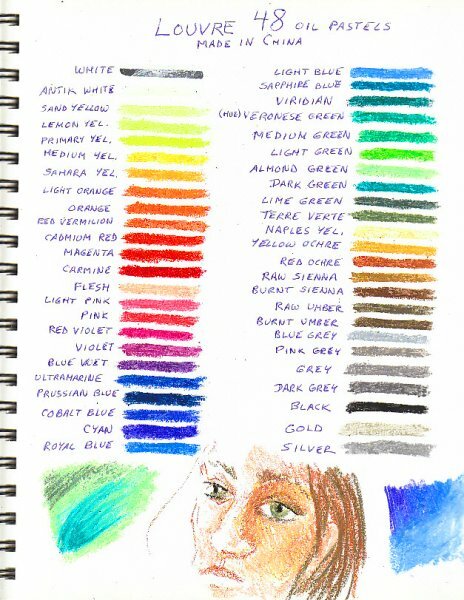 Below is my color chart with some sketch experiments including a partial face from imagination, a blended patch of blues and a dark green patch burnished with light green. The fact that light doesn't cover dark as much and doesn't move it as much may make these great for where you want glazing effects rather than painterly mixing.